Isoorientin (ISO) is a flavonoid compound in the human diet, and has been known to possess various bioactivities. However, the effects of ISO on microglia inflammation have not been investigated. The current study investigates the neuroprotective effect of ISO in LPS-activated mouse microglial (BV-2) cells. ISO significantly increased the BV-2 cells viability, blocked the protein expression of inducible nitric oxide synthase and cyclooxygenase-2, and decreased the production of nitric oxide, pro-inflammatory cytokines including tumor necrosis factor-α and interleukin-1β. The activation of mitogen-activated protein kinases (MAPKs) was blocked by ISO, and NF-κB nuclear translocation was decreased by ISO both alone and together with NF-κB inhibitor (PDTC) and MAPKs inhibitors (U0126, SP 600125, and SB 203580). Furthermore, ISO strongly quenched intracellular reactive oxygen species (ROS) generation. 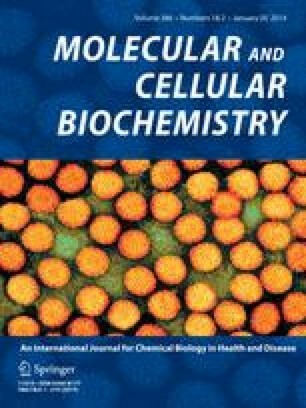 ROS inhibitor (N-acetyl cysteine, NAC) significantly inhibited pro-inflammatory cytokines release and NF-κB and MAPKs activation, indicating that ISO attenuated neuroinflammation by inhibiting the ROS-related MAPK/NF-κB signaling pathway. The online version of this article (doi: 10.1007/s11010-013-1854-9) contains supplementary material, which is available to authorized users. This work was financially supported by the Young Scientists Fund of the National Natural Science Foundation of China (No. 31000757), and the National “Twelfth Five-Year” Plan for Science and Technology Support (No. 2012BAH30F03).